2012 Medora Musical Opens Friday! The day that we prepare for and eagerly anticipate is just a few days away! Opening night of the Medora Musical and Pitchfork Steak Fondue not only marks the beginning of an exciting season for us, but also the start of many new adventures and life changing experiences in Medora. The beauty of the North Dakota Badlands, historical landmarks, and fun family attractions continue to captivate folks from across the region, nation, and even the world! The Medora Musical performs nightly at 8:30 p.m. MDT debuting this Friday, June 8. This year’s show will feature catchy songs, high energy choreography, beautiful sets, and fantastic guest variety acts. Eight brand new Burning Hills Singers join our host, the Queen of the West, Emily Walter and our live band, the Coal Diggers! The Medora Musical showcases the talent of the Burning Hills Singers while remaining true to the founding principles set forth by Harold Schafer: horses, singing, dancing, world-class variety acts, gospel, patriotism and much more in a family show! In 1964, Harold Schafer contracted with Al Sheehan of Minneapolis to create a show for his newly acquired amphitheater. Harold asked Al to identify variety acts to include in the show that the folks from North Dakota would not have to travel far from home to see. World-class variety acts right in our own backyard! Continuing with that tradition we are kicking off the 2012 season with a variety act that you won’t want to miss! Breaksk8, a Hip Hop dance crew on roller skates from Kokomo, Indiana, has been featured on several TV shows including NBC’s “America’s Got Talent,” MTV’s “America’s Best Dance Crew,” and Disney’s hit show “Shake it Up.” Since the group formed in 2001, Breaksk8 has amazed audiences around the globe with their unique style of entertainment on wheels. Most recently Breaksk8 was featured on the Hunan Satellite Network, which was viewed by more than 500 million people in mainland China. To register your 4th grader today just print our registration form to mail back, or call 1-800-Medora-1 and ask for Group Sales. The registration form lists a deadline of June 1st, but we will take day-of registrations. Bully Pulpit Golf Course – Open now! If you haven’t made it out to Bully Pulpit yet… What have you been doing?! Our 18 gorgeous holes are waiting for you. Some courses impose themselves on the landscape. The Bully Pulpit Golf Course, surrounded by the dramatic North Dakota Badlands, conforms to the surrounding terrain. Some holes play in meadows and woodlands, while others follow the meandering Little Missouri River. Holes fourteen through seventeen are built into the rugged Badlands. Located three miles south of Medora on East River Road, this 18-hole course features five tees, ranging in length from a comfortable 4,750 total yards from the forward tees to a challenging 7,166 at the tips. Plus, you can warm up your swing on the driving range. Follow is on Facebook and Twitter for access to exlusive deals and giveaways! 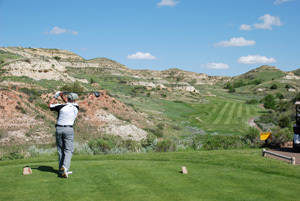 Call 1-800-Medora-1 or reserve your tee time online today! You’re social and so are we! We would love to see and hear about your time in Medora. Find us on Facebook, Twitter, and YouTube! Connect with us today. You may even see some social media specific deals, news, and sneak-peaks!